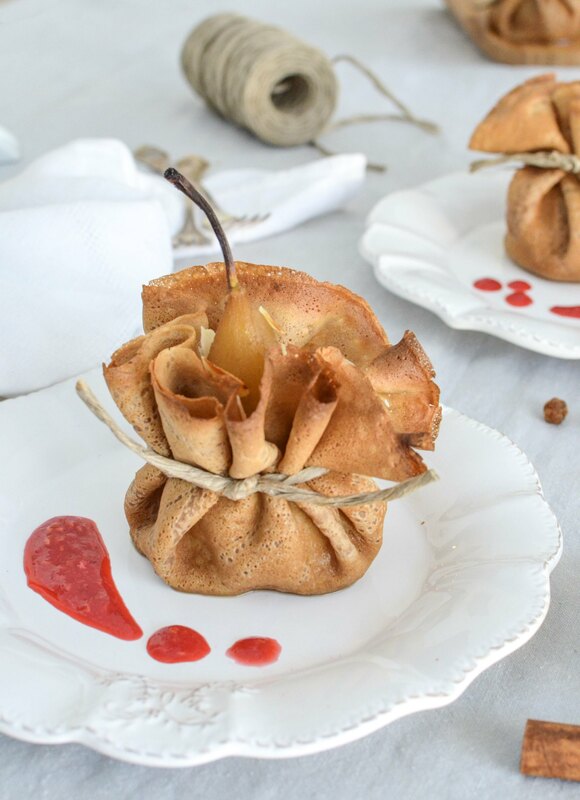 If you want to wow your sweetheart this Valentine’s day, these elegant poached pear aumônières will melt everyone’s heart! Every year on February 2nd, we celebrate la Chandeleur, a day where everyone cooks crêpes. It is the occasion to practices your best wrist moves to faire sauter les crêpes as we say in France, a.k.a. throw the crêpes high in the air so they flip and land gracefully in the pan (that is if they don’t stick to the ceiling…). 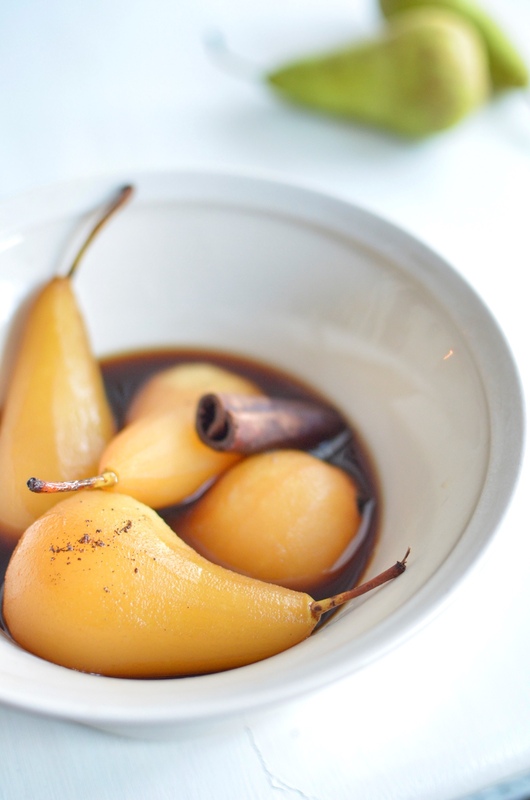 The crêpes I prepared to wrap my poached pears are made of chestnut flour. Have you ever baked with chestnut flour before? It is made of ground whole chestnut and has a distinctive earthy flavor. Funnily when I started experimenting with all sorts of gluten free flours two years ago, I didn’t quite like chestnut flour taste, and forgot about it for a long time. Thinking of it, I believe I used way too much of it in my flour mixes back then. The result: too dense or too strong flavored pastries. I’ve learned a lot by now about combining gluten free flours. 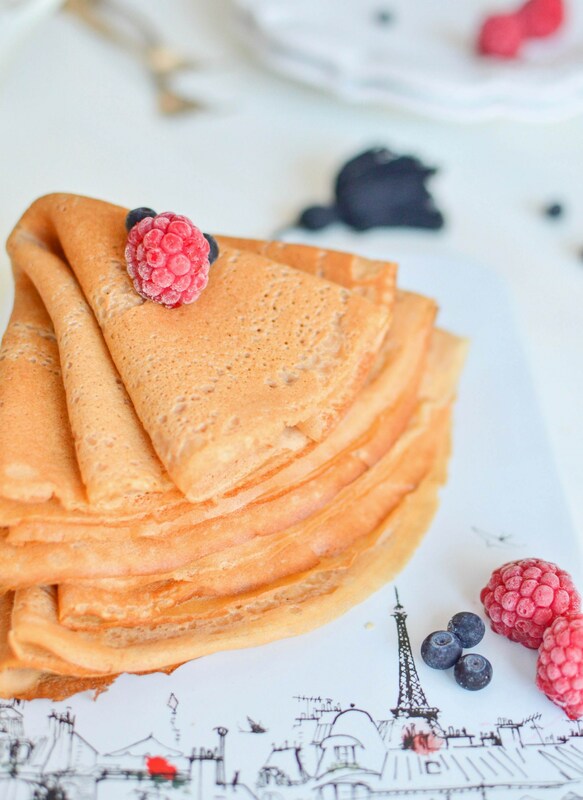 These chestnut flour crêpes are so yummy, you’ll want to eat a few just on their own (I got you covered with extra crêpe batter for the gourmands)! In case you are wondering why they are called aumônières, the name actually refers to their shape, resembling the little purse bags French people used in the Middle Ages to pass coins to beggars. In the kitchen, an aumônière is a crêpe or filo pastry filled with sweet or savory preparation. Enjoy this indulgent winter dessert and if chestnut flour is tricky to find in your area, no worry, you can also use my basic French crêpe recipe based on almond flour. Bon appétit! Before you get started, my ‘Gluten Free Living’ survey on still open! Please let me know how gluten free life is for you. It takes only few minutes and I’d love to hear about you! 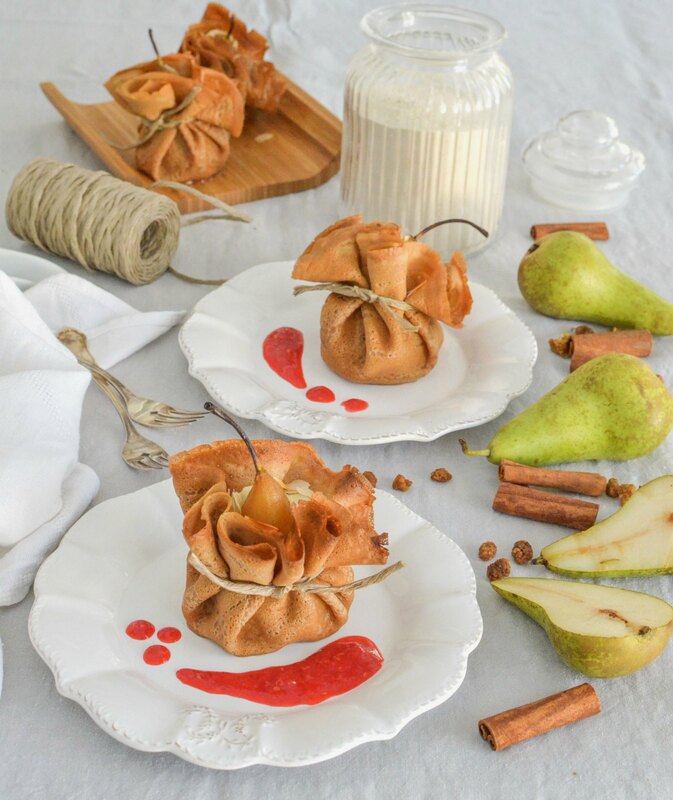 Wow your guests with these elegant poached pear aumônières, made with gluten free chestnut flour crêpes and served with a raspberry coulis. Bon appétit! Poach the pears: In a large saucepan just large enough to hold the pears, heat water and sugar until the sugar is dissolved. Grate the vanilla pod and place the seeds and pod in the saucepan, as well as the cinnamon stick. Peel the pears. Place them into the syrup. Add the lemon juice. Cook about 15 minutes until the pears are soft but not falling apart. Remove from the heat and let the pears cool down in the liquid. Carve the bottom and remove the core. Crepe batter: While the pears are cooking, start preparing the crepe batter: In a large bowl, mix the flours, starch, sugar and salt together. Incorporate progressively with a whisk the mix of eggs, milk and oil until you get a smooth batter. Let the batter rest for 10 minutes. Preheat the oven 180 degrees. Cook the crepes: Give the batter a good stir before using it. Heat a crepe pan or large skillet over a medium-high heat. Spread a tiny bit of oil (I use deodorized coconut oil) and rub it all over the pan. Pour a thin layer of batter in the hot pan, lifting it from the stove. Quickly rotate and tilt the pan with your wrist in a circular motion, until the pan is evenly covered, and put it back on the stove. When the edges start to lift and there is no liquid anymore, flip the crepe to the other side and let it cook till it is golden. Repeat with the remaining batter. Place a pear in the center of a crêpe and crimp it closed on top to form a small purse. Repeat for each pear. Place in an oven pan and bake for 10 minutes. Serve warm, with a raspberry or strawberry coulis (you can easily make your own by mixing 150 g of berries with a spoon of sugar). Bon appétit! Impressionez vos invités avec ces aumônières de crêpes à la farine de châtaigne et poires pochées. Gourmandes et sans gluten! Optionel: Mélange d'amandes effilées, cannelle, baies mulberry séchées (ou raisins secs, dattes, noisettes concassées...), sucre de coco - selon vos goûts, pour remplir le fond des poires. le sucre puis ajouter le bâton de cannelle, la gousse de vanille grâtée et les clous de girofle. Ajouter les poires et le jus de citron et laisser cuire 15 minutes environ jusqu'à ce que les poires soient tendres. Laisser les poires refroidir dans le sirop. Egoutter et ôter le coeur à partir de la base. Faire les crêpes: bien mélanger les farines, fécule, sel et sucre avec un fouet. Ajouter peu à peu le mélange d'oeufs, lait et huile en battant bien. Laisser reposer la pâte 10 minutes. Huiler légèrement une poêle, la chauffer et verser de la pâte en faisant tourner la poêle pour bien recouvrir le fond. Faire dorer légèrement d'un côté puis de l'autre. Confectionner les autres crêpes. Préparer les aumônières: Remplir la base de chaque poire du mélange amande-fruits secs-cannelle. Déposer une poire au centre de chaque crêpe et rassembler la crêpe autour des poires. Attacher avec de la ficelle de cuisine. Servir chaud avec un coulis de framboise ou de fraise (facile à faire soi-même en mixant 150 g de fruits avec une cuillère de sucre). Bon appétit! « Gluten Free Living: Survey Time!